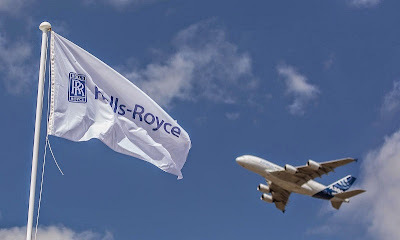 The £70 billion civil aviation order book of world-renowned engineers, Rolls-Royce, has been boosted further at the Farnborough International Airshow where aircraft manufacturer, Airbus won business worth more than £44 billion for 496 aircraft. At the start of the week long exhibition, Airbus announced that it had selected the new Trent 7000 from Rolls-Royce as the exclusive engine for the new Airbus A330neo. The aircraft manufacturing subsidiary of EADS, a European aerospace company, went on to announce deals with major customers for a total of 121 A330neos worth £19 billion. The Trent 7000 builds on the market-leading Trent 700 to deliver significant performance benefits, improving specific fuel consumption by 10 per cent and halving perceived noise. Agreements included selection by AirAsia X (50 aircraft), Transaero Airlines (12) and lessors Air Lease Corporation (25), CIT (15) and Avolon (15). Elsewhere in the civil market, Kuwait Airways selected the Trent 700 to power their fleet of five new A330 aircraft and Air Mauritius ordered six Airbus A350 XWB aircraft, powered by the Trent XWB. Away from the show, a higher thrust version of the Trent XWB, the world's most efficient large civil aero engine, ran for the first time on the test bed. The Trent XWB, specifically designed for the A350 XWB, is the fastest-selling Trent engine ever, with more than 1,400 already sold. The engines will contain turbine blades manufacturing in Rotherham at Rolls-Royce's Advanced Blade Casting Facility (ABCF). The Nickel-based superalloys are made from single crystals using the very latest manufacturing techniques. These SX blades generate the power of a Formula 1 racing car and temperature within the high pressure turbine is 1,700 degrees centigrade, hotter than the melting point of the turbine blades themselves, so they have to be coated with a special ceramic and cooled with air passed through the discs and out of a series of precise holes in the blade. Production is underway in Rotherham and the ground-breaking manufacturing techniques are being validated. The facility, on the Advanced Manufacturing Park (AMP) has the capacity to produce 200,000 turbine blades per year. There are over 65 turbine blades in every iconic Trent engine. Rolls-Royce also announced a £50m order from lessor MG Aviation for Trent 1000 engines to power two Boeing 787-9 Dreamliners. United Airlines extended its TotalCare agreement to support its fleet of RB211-535 engines powering the Boeing 757.